Walking through the street market of Chandi Chowk was an otherworldly experience. The variety of people in various states of being is hard to process. The sheer density alone is hard to process. Everyone looks different. Everyone has a different story. Everyone is trying to sell something or ask for spare rupees. The sensory barrage is completely encompassing. They sell almost everything possible in an old world market -- vegetables, fried food, clothing, ladies' undergarments, children's toys, Hindu statues, good luck charms. Occasionally I would spot incredibly familiar, and therefore disconcerting, goods out of the corner of my eye. A knit sweater hanging on a wall with the burnt orange letters spelling out Texas where I went to graduate school, for instance. 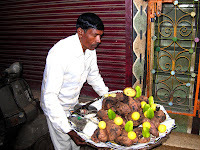 Disappointingly, the spice market appeared to be closed on Sunday, but we bravely wandered back through the dark labyrinthine streets where people lived to see life behind the doors of Old Delhi, so to speak. We saw people doing a variety of odd jobs -- heaping enormous mounds of dried chili in preparation for the market, dirty barefoot children shucking mounds of betel nuts in dark cement corners, men shaving each other with straight razors, vendors selling various snacks and spices in large aluminum containers, others wheeling fruits and vegetables for sale in the narrow stone corridors. Old laundry snaked across the buildings amidst hives of electrical wiring tenuously stretched through the quarters. We came across small Hindu offerings to gods and goddesses with paints, flowers, and lit candles in unassuming corners. Brave Inga found a seller wheeling cooked sweet potatoes over warm coals through the streets and decided to treat us. The man cut the potato into sections, dousing it with plenty of lemon juice and applying red chili pepper. I usually don't like the taste of sweet potato, but the lemon and chili undercut the taste offering a pleasant flavor. We talked in broken English to the man for a while telling him about ourselves and asking him questions. I took a picture of the man and he began talking quickly and pointing at me. Inga, who is trying to learn Hindi, said, "He wants you to give him money for taking his picture." I obliged pulling out five rupees handing it to the man, who refused it shaking his head in frustration that I didn't understand him better. It was the first time I had seen someone in India refuse money and it was very stirring. Really, everyone is after tourist money because they know tourists can afford it and because so many here have so little. But I've perceived that Indians have a certain pride that completely eclipses the need for money. This man, I believe, would have taken any money we had given him at first, but because we were genuinely interested in talking to him, at that point the money largely became irrelevant. I went on to have similar experiences with other sellers and services. Though people may try to overcharge offering "tourist prices," no one I have met would try to steal outright from me. People have pointed out any time I've dropped money picking it up for me, and when accidentally overpaying, I'm always refunded the difference. This is one of the many seeming paradoxes of India that I find immensely attractive. We strolled through more crowded streets of crumbling black brick and brightly pastel colored doors before calling our car. The sun was setting over Delhi, the dust saturating the city in beautiful pinks and peaches. We drove to the Gandhi memorial in a beautifully manicured green park to pay our barefoot respects and make a modest offering to the poor. We felt pretty drained, but in a good mood having met Inga, her badly needed energy and inquisitiveness invigorating us. Wincing at the overpowering smell of feet accompanying such memorials and mosques, I looked down to notice white Hello Kitty socks peeking out at me from the base of Inga's jeans. I smiled in appreciation. We went and had a banana lasi and some Indian snacks at Hotel Broadway before exchanging our e-mails and cell phone numbers and saying goodbye. Tomorrow we would take the train to Agra to visit the Taj Mahal, leaving the sanctity of Lutyen's for the promise of the open rail.